Discover Prince Albert’s contribution to the Museum’s library collections. This display highlights Prince Albert’s relationship with the library of the South Kensington Museum (now the V&A), primarily through an examination of his personal contribution to its collections. The selection of books he chose to make accessible to the public demonstrates his desire to promote knowledge and learning in science and the arts. 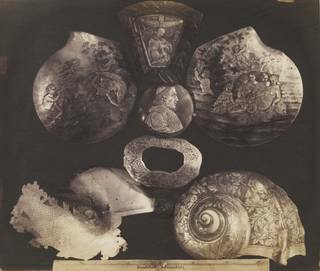 Image: Photograph of shells, carved and engraved between the 16th and 18th century. Probably by Ludwig Belitski, commissioned by Alexander von Minutoli for the Minutoli Institute Liegnitz (now Legnica). About 1853.